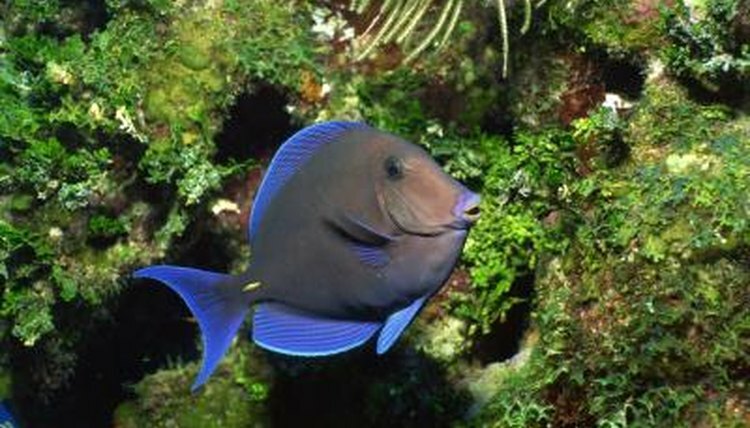 Several species of tang or surgeonfish go by the name "blue hippo tang." This includes the Indo-Pacific region's Acanthurus leucosternon, also called the powder blue tang and the Atlantic Ocean's Paracanthurus hepatus, also called the blue tang. However, the different species are related and have similar care and appearances. These species are prone to several protozoan diseases, including marine ich and velvet. For this reason, quarantine is recommended for two weeks before introducing blue hippo tangs to the main aquarium. In a quarantine tank, they can be treated more easily. Additionally, many remedies for these diseases can harm expensive invertebrates, like coral and crustaceans. The blue hippo tang requires a large aquarium of at least 90 gallons. They also need plenty of rock-work for hiding places and grazing. At the same time, these fish need a lot of swimming room since they are very active fish. They can do just fine in a reef tank and will not eat expensive coral. Avoid keeping more than one tang in a fish tank as they can fight fiercely among themselves. Blue hippo tangs are otherwise peaceful. Tangs require water with lots of oxygen. The best way to supply this is by adding water movement to the tank. Like many marine fish, they have very specific requirements in terms of water chemistry. Blue hippo tangs require water with a pH of 8.0 to 8.4. They also need tropical temperatures between 73 and 82 degrees Fahrenheit. And the water must have a specific gravity of 1.023 and 1.025. Blue hippo tangs are mostly vegetarian and need lots of vegetable matter in their diet. Live rock is a must in their aquariums, since it can provide algae to graze on. Blue hippo tangs also benefit from supplemental green food, like nori or lettuce. You can feed this kind of food with veggie clips. Some pet shops and grocery stores carry nori. Blue hippo tangs also like the concessional live food treat, like brine shrimp.